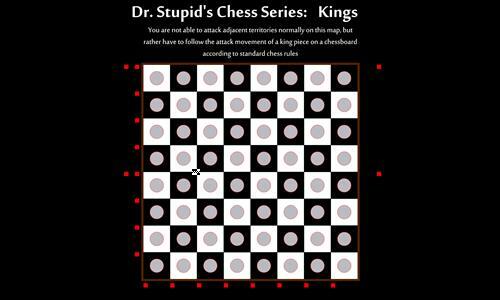 This is a standard chess board where your attacks can only follow the movement patterns of the king piece. Can you find the easter egg and can you explain why it's there? Either way, Have Fun! Review by Krulle on 4/3/2014. lol. you get the prize! Review by Nathan on 4/3/2014. Good stuff. An interesting variant would be to assign each square in the home row a value equal to chess point valuation of each piece. That would be interesting. This is chess map 4 out of 6 for me and I'm a bit ready for a new project, but I've been having fun with your chess series as well! Review by Robc01 on 4/17/2014. Review by Disero on 4/28/2017.